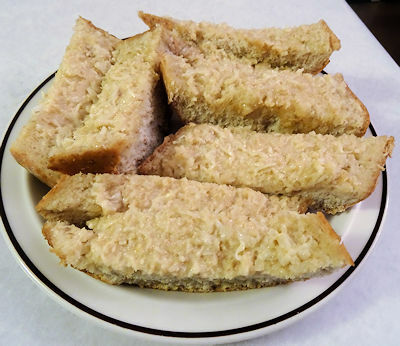 We like garlic bread as a side dish. I make it often but decided to try something different. I thought some Lea & Perrins Worcestershire Sauce would add to the flavour profile. So I made L&P Garlic Bread. I took a six inch long section of a whole wheat French loaf and cut it in half lengthwise. I melted 15 ml (1 tablespoon) butter in a fry pan over medium heat. I added the garlic and cooked for just a minute or two to infuse the melted butter. I mixed the butter/garlic mixture with parmesan cheese, softened butter, mayonnaise and Worcestershire sauce. I spread that mixture on each half of the bread and put the halves together again. I wrapped it in aluminum foil and put it in the smoker. I was smoking Dill Salmon at the same time so the smoker was set to 200 F. At this low temperature, I baked it for 50 minutes. You could also put it in a 325 F oven for 25 minutes. I unwrapped it and sliced it into 4 slices. 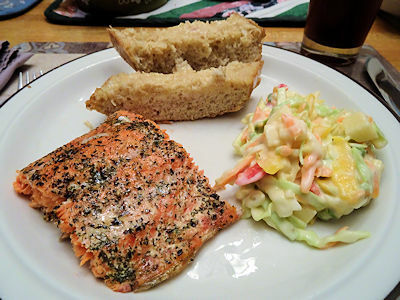 We served it with the salmon and coleslaw. I love it when an idea works. The Worcestershire sauce added a rich sweetness but also didn’t jump out. It just made it a more complex flavour. Try it! You’ll like it! Heat half the butter in a fry pan over medium heat until melted. Add the garlic and saute for 2 minutes. Mix the melted butter/garlic mixture with the cheese, mayonnaise, Worcestershire sauce and the remaining butter. Spread the butter mixture over each half. 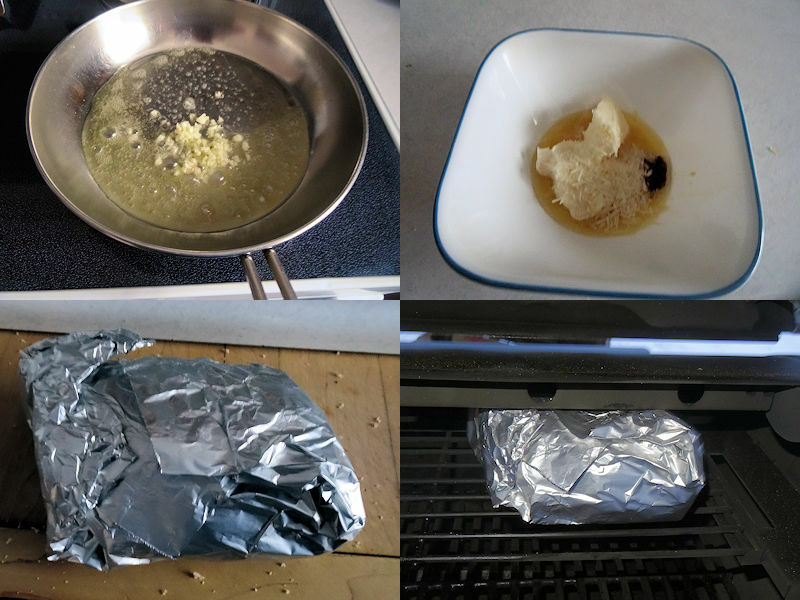 Put the loaf back together and wrap in foil. If cooking in a smoker between 200-250 F, bake for 50 minutes. If cooking in an oven, bake at 325 F for 25 minutes. Unwrap and cut into 4 slices. Well to coin a phrase! Brilliant!! I’m going to give this one a try. You can’t go wrong with garlic bread, Sam! The Lea & Perrins people need this recipe!